How do you define something that NEVER changes? The New York Knicks cannot get OUT of MEDIOCRITY, they went 1-3 the past week and are in the SAME spot in the standings. They have a HARD time WINNING games on the ROAD this season and that continued LAST week and it will be a PROBLEM this week as ALL of their games this week are on the ROAD. IF the Knicks WANT to make the Playoffs this season, then they NEED to start WINNING games on the ROAD or ELSE they will sitting on their COUCHES once again during the Playoffs. The Knicks took on the lowly Chicago Bulls on the ROAD last Wednesday in a game that HAD to WIN. The Knicks played WELL but not enough to get the WIN and LOST the game by FIVE points. They traveled to San Antonio for a ROAD game against the Spurs on Thursday and the Knicks got BLOWN OUT. The Spurs are one of the GOOD teams in the Western Conference, so it was not SHOCKING that the Knicks got BLOWN OUT. The Knicks then traveled to New Orleans to take on the Pelicans on Saturday Night, and got a MUCH NEEDED WIN. Both the players and the fans were JOYOUS and knew the importance of the team WINNING on the ROAD to close out the year. The Spurs came to Madison Square Garden and took care of the Knicks last night to close out another BAD week for the Knicks. The Knicks have not been GOOD over the past few weeks, but LUCKILY for them, the rest of the Eastern Conference has also STUNK during that time. The Knicks are only ONE game out of the Playoffs and could REALISTICALLY climb all the way up to the FOUR seed in the East if they are able to FIX their ROAD woes. They have been led by Kristaps Porzingis and Michael Beasley, who have been GREAT in the absence of Tim Hardaway Jr. The Knicks need to continue to have a GREAT offense until their defense gets BETTER. They CANNOT seem to find a way to RESTRICT teams from scoring NINETY or MORE points, which has been HURTING them. The Knicks need to play BETTER on defense before the Playoffs become realistic for this team. The one SHINING moment from this week was not a POSITIVE moment for a Knicks’ player but it was FUNNY for the rest of us. 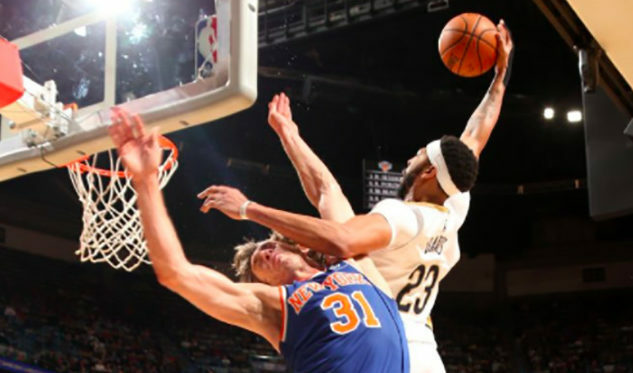 It happened when Pelicans’ star Anthony Davis DUNKED all over Knicks guard Ron Baker. The DUNK was MARVELOUS and it was TRENDING in the NBA World for the whole night but it was not all FUN and games for the Knicks. Ron Baker was FORCED to go the locker room following the DUNK, due to an eye injury, and things seemed serious for a moment. Baker, however had SEEMED to RECOVER and made light of him getting DUNKED on, the next day on Instagram. All in all last week was not GREAT for the Knicks, but they were able to find some HUMOR from WINNING a game last week. This week the Knicks have THREE road games starting with the Wizards in Washington Tonight, the Miami Heat on Friday Night, and they close out the week against the Dallas Mavericks on Sunday Night. The Knicks almost have to go 3-0 this week to keep pace with the REST of the teams in the Eastern Conference. This season still has some PROMISE for the Knicks, but if they continue to STRUGGLE then that PROMISE will turn into disappointment for the Knicks.